References m_windowMain, m_wMergeAbove, m_wMergeBelow, m_wMergeLeft, m_wMergeRight, s_delete_clicked(), s_destroy_clicked(), s_merge_above(), s_merge_below(), s_merge_left(), s_merge_right(), and s_response(). References _constructWindowContents(), abiAddButton(), abiDialogNew(), AP_Dialog_MergeCells::ConstructWindowName(), XAP_Dialog::getApp(), XAP_App::getStringSet(), XAP_StringSet::getValue(), m_wContents, m_windowMain, and AP_Dialog_MergeCells::m_WindowName. References XAP_App::getStringSet(), XAP_StringSet::getValueUTF8(), label_button_with_abi_pixmap(), m_lwMergeAbove, m_lwMergeBelow, m_lwMergeLeft, m_lwMergeRight, XAP_Dialog::m_pApp, m_wContents, m_wMergeAbove, m_wMergeBelow, m_wMergeLeft, m_wMergeRight, and s.
References AP_Dialog_MergeCells::ConstructWindowName(), m_windowMain, AP_Dialog_MergeCells::m_WindowName, AP_Dialog_MergeCells::setAllSensitivities(), and UT_ASSERT. 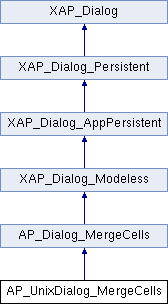 References _connectSignals(), _constructWindow(), _populateWindowData(), abiSetupModelessDialog(), BUTTON_CLOSE, AP_Dialog_MergeCells::startUpdater(), and UT_return_if_fail. References m_lwMergeAbove, m_lwMergeBelow, m_lwMergeLeft, m_lwMergeRight, m_wMergeAbove, m_wMergeBelow, m_wMergeLeft, m_wMergeRight, AP_Dialog_MergeCells::radio_above, AP_Dialog_MergeCells::radio_below, AP_Dialog_MergeCells::radio_left, and AP_Dialog_MergeCells::radio_right. Referenced by _constructWindowContents(), and setSensitivity(). Referenced by _constructWindow(), and _constructWindowContents(). Referenced by _connectSignals(), _constructWindow(), activate(), AP_UnixDialog_MergeCells(), destroy(), and notifyActiveFrame(). Referenced by _connectSignals(), _constructWindowContents(), and setSensitivity().